But before the Marching Eagles take the national stage, they’ll be honoring veterans at home. During halftime of Friday night’s football game, Maple River will honor a trio of local veterans: Maple River graduates Jessie Lloyd and Andrew Nortrup-Uhrich and retired Maple River teacher Ted Mays. Lloyd and Mays will be traveling to New York to participate in the parade. Representatives from the offices of Sen. Amy Klobuchar, Sen. Norm Coleman and Congressman Tim Walz also are slated to attend the ceremony, which will feature a rendition of “Stars and Stripes Forever” and the school fight song. Carpenter said she’s hoping her students gain an appreciation for veterans by the time they return from New York. In Rochester today, Congressman Walz and Brian Davis will face off at the Rochester Area Chamber of Commerce debate. Registration was required for the event, which costs $20 for members and $30 for non-members. We look forward to seeing how much the world expands following the event. KTTC-TV's Fanna Haile-Selassie reports on the contest in Congressional candidates prepare for debate. (Also on Fox KXLT). The visuals are telling: Walz is surrounded by veterans eager to work for his re-election, while Davis is alone (okay, there's a tree on screen with him). In the piece, Davis calls his attack ad a "fair contrast" ad. We think the contrast part might be right when the GOP candidate's spot is stacked up against Walz's ads. Walz's ads focus on policy. In the Republican's ad, viewers learn a great deal about what Davis thinks of Walz--and what Davis thinks is fair. It's not pretty. Nor is the sight of a grown man telling voters he shoots straight. Perhaps Walz should challenge him to a clay shoot so people will have something more than Davis's word on it. Who knows? Perhaps Davis is a better shot than he is a treasurer or property owner or fact checker or resume writer. Why attack mode rather than introduction ads? Roll Call reports Boehner Tells Republicans to Attack. Looks like Davis is following orders from the Beltway. No wonder, given that we're seeing headlines like GOP finds plucking off House Democrats difficult. If you're one of those people that believes the general election doesn't begin until the negative ads start to fly, then the race for the first district congressional seat in Minnesota just got started. The Mankato station also included footage of the local Vets for Walz stop. Self-described mommy blogger Jennifer describes the scene in Rochester--and the local reaction to the news that Michelle Obama is coming to Minnesota on Monday. (We highly recommend her post, Dedicated to Todd, which tells the story of how a conservative Army buddy helped her hone her own perspective). The Post Bulletin notes that VFW committee endorses Walz; MMA endorses Davis. Over at The Rochester Democrat, there's news of another October 18 Walz-Mondale event, this time in Rochester. Vice-President MOndale and Walz will be in St. Peter for a breakfast event earlier in the day. Vox Verax posts the Walz column on his "No!" 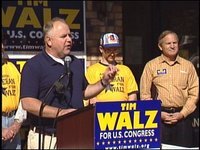 vote against the Bailout in Tim Walz: Public 'poorly protected by the bailout plan' An interesting article in the Caledonia Argus notes how Wall Street’s shake-up doesn’t seem to be affecting Main Street. In other news, KAAL-TV reports on how Rochester Officials React to Schieffer's Departure. The Worthington Globes praises a MN Chamber of Commerce initiative to promote energy conservation programs in An 'energy' boost for businesses. Photos: Walz (in suit) meets with veterans early this summer (above); Veterans for Walz rally in Rochester (below).